As identified above, more moles of amino acids are absorbed as small di- and tripeptides (peptides) than as free amino acids. The importance of this process, along with the subsequent understanding that most (3-lactam antibiotics appeared to compete for absorption with peptides, generated a tremendous amount of interest in identifying the process by which peptides were absorbed. Research using either hydroly-s is-resistant peptides or poorly metabolized p-lactam antibiotics in whole-tissue, cell line and membrane vesicle experimental models demonstrated that many species are capable of mediated absorption of intact di- or tripeptides. An important understanding from early studies was that peptide transport activity is unique from free amino acid transport. Additionally, the transport of dipeptides is dependent on an extracellular-intracellular H+ gradient and not a Na+ gradient (Ganapathy et ai, 1984). Subsequent research showed that the pH dependence was specifically a HVpeptide cotransport process (Daniel et ai, 1991, 1992). After coabsorption of the H+ and peptide, the pH gradient is re-established by the Na+/H+ exchanger, which also resides in the brush border membrane. This counter transport is dependent on an extracellular-intracellular Na+ gradient. The increased Na+ concentration of the cell is re-established by the function of the basolateral membrane bound Na+/K+ ATPase. Because ATP is expended for two processes after absorption of the peptide, HVpeptide-coupled transport is considered to be a 'tertiary' transport process. Research establishing the existence of an H+ gradient across the 'microenvironment' (pH 5.5-6.3) of the apical membrane, and that H+-coupled peptide transport is concentrative, has been well reviewed (Ganapathy et ai, 1994; Webb and Matthews, 1994). How these ion transporters function to support H+-coupled peptide transport is illustrated in Fig. 3.1. The known biochemical parameters of endogenously and exogenously expressed PepTl activities of farm animal species are summarized in Table 3.1. When compared to the functional activities of humans and laboratory animals (Table 3.2), it is clear that PepTl-like activity is well conserved among animals. Table 3.1. Michaelis-Menten constants for low-affinity, H+-dependent peptide transport activity of farm animal species. °BBMV, brush border membrane vesicles. Table 3.2. Michaelis-Menten constants for low-affinity, H+-dependent peptide transport activity of gastrointestinal tissues and cell lines. aK- for Cefadroxil inhibition of Gly-Sar transport. bBBMV, brush border membrane vesicles. °BLMV, basolateral membrane vesicles. cells and peptide and ^-lactam antibiotic substrates (Table 3.2), demonstrated that the affinities of apical and basolateral membrane-localized peptide transport activities differ (Saito and Inui, 1993). Most recently, transport of Gly-Sar across the basolateral membrane of Caco-2 cells was shown to be less sensitive to changes in external pH, as compared to the apically located system (Terada et ai, 1999). In addition, the relative ability of cefadroxil to competitively inhibit Gly-Sar uptake was less for basolateral than apical transport, and basolateral transport was unable to concentrate intracellular Gly-Sar, in contrast to the apical transport. Therefore, it is likely that basolateral peptide transport is mediated by a single low-affinity, ^-independent, facilitated transport system. That peptide transport systems possess functional differences, depending on which membrane they are localized in (apical vs. basolateral) is analogous to differences in the location and function of many mammalian amino acid transport systems (Kilberg and Haussinger, 1992; see below). How the differential membrane localization of these transporters contributes to peptide-bound (and free) amino acid absorption across enterocytes is illustrated in Fig. 3.1. In terms of the energetic cost associated with H+-coupled peptide uptake, data from initial biochemical studies were mixed, indicating that either 1 or 2 H+ were co-transported per peptide molecule (Ganapathy and Leibach, 1985; Hoshi, 1985). Initial studies that characterized the biochemical activity of a protein capable of H+-coupled peptide uptake (PepTl; see below) after overexpression by Xenopus laeuis oocytes (Fei et al., 1994) determined that the H+:peptide ratio for the neutral peptide Gly-Sar is 1:1. More extensive research with additional PepTl substrates, however, has revealed that the number of H+ required for peptide transport across the apical membrane of enterocytes depends on the charge of the peptide. For example, rabbit PepTl displays H+:peptide ratios of 1:1, 2:1 and 1:1 for neutral, acidic and basic dipep-tides, respectively (Steel et al., 1997). Whether acidic peptides are relatively less well recognized in the presence of a lower pH than are neutral or basic dipeptides, has not been definitively established, as evidenced by the contradictory data from whole tissue (Lister et al., 1997) versus in uitro (Brandsch et al., 1997) studies. ach epithelia of ruminants are also capable of H+-mediated peptide absorption (Matthews, 2000a). With the seminal cloning of PepTl protein (Fei et al., 1994), the mechanism responsible for H+-coupled absorption of intact small peptides (predominantly di- and tripeptides) from the digesta of the intestinal lumen by enterocytes was identified. In mammals, PepTl mRNA encodes an integral membrane protein that is predicted to possess 12 membrane-spanning domains, with a relatively large extracellular loop between transmembrane domains 9 and 10 (Leibach and Ganapathy, 1996). Chicken PepTl mRNA, however, is significantly smaller than the mammalian PepTl mRNA (1.9 kb versus about 3 kb; Chen et al., 1999) and is predicted to encode a protein that lacks the large extracellular loop present in mammalian PepTl (Pan et al., 2001a). The distribution of PepTl mRNA along the small intestine also differs among species. The expression of PepTl for a rabbit is most abundant in the duodenum and jejunum, lower in ileum, and very low in the colon (Freeman et al., 1995). In contrast, PepTl expression in rats is most abundant in the ileum as compared to the duodenum and jejunum (Miyamoto et al., 1996). In ruminants, PepTl is expressed by small intestinal epithelia, and by omasal and ruminal epithelium (Chen et al., 1999; Pan et al., 2001b). These differences in expression of PepTl reflect the site of protein digestion and the availability of substrates for a given species and confirm previously identified biochemical activities. The molecular characteristics of known farm animal PepTl mRNA ortho-logues, and their tissue-specific expression, are summarized in Table 3.3.
aab, abomasum; br, brain; ce, caecum; co, colon; cr, crop; du, duodenum; gi, gizzard; il, ileum; je, jejunum; li, liver; Im, longissimus muscle; om, omasum; pr, proventriculus; ru, rumen; sm, skeletal muscle; stm, semitendinous muscle. various species orthologues of PepTl is regulated. As selectively collated in Table 3.4, the sensitivity of PepTl mRNA and protein expression and/or functional activity to nutritional, ontogenic, disease and various metabolic affectors has been evaluated. In terms of dietary regulation of PepTl, increasing protein and casein content of the diet stimulates PepTl expression and/or activity (Ferraris et al., 1988; Erickson et al. 1995; Shiraga et al., 1999). In terms of specific substrate regulation, either specific or mixtures of peptides appear capable of stimulating PepTl activity (Ferraris et al., 1988; Brandsch et al., 1995; Adibi, 1997b) and expression (Shiraga et al., 1999; Ogihara et al., 1999), but not, generally, amino acids. In an apparent paradox, dietary deprivation also stimulates PepTl expression and activity. Specifically, the effect of a one day fast on the uptake of Gly-Gln by rat jejunal brush border membrane vesicles was to double H+-dependent Gly-Gln uptake (Thamotharan et al., 1999a). Concomitant with this increased activity was a threefold increase in the amount of PepTl mRNA and protein content of the cells. The finding that starvation appears to stimulate was supported by the observation that starvation of rats for 4 days also results in increased levels of PepTl mRNA by intestinal epithelia (Ogihara et al., 1999; Ihara et al., 2000). Consistent with the robust stimulation of PepTl activity by nutritional surfeit or deficit, 5-fluorouracil-induced (a chemothera-peutic agent) injury to the intestinal epithe lium of rats results in the preservation and production of PepTl mRNA, relative to depressed mRNA levels observed for sugar (SGLT1) and amino acid (NBAT) transporters (Tanaka et al., 1998). In keeping, PepTl protein levels were unaffected, whereas sucrase and Na+-dependent glucose SGLT1 activities were decreased. Collectively, the nutritional and disease status data suggest that the collective effect of nutritional challenge is to increase PepTl uptake capacity. With regard to identifying specific mechanism^) responsible for PepTl regulation, the culture of Caco-2 cells in the presence of pentazocine (a selective receptor ligand) resulted in an increase in PepTl mRNA and maximum velocity of Gly-Sar transport (Fujita et al., 1999). In contrast, insulin seems to stimulate PepTl activity in an acute, post-translational manner (Thamotharan et al., 1999b). Specifically, culture of Caco-2 cells in physiological levels of insulin (5 nM) for more than 1 h apparently results from the insertion of pre-existing PepTl from a cytoplasmic pool, and not from de novo synthesis. In keeping with these reports, PepTl uptake capacity may be regulated by protein kinase C, as the blocking of calmodulin-regulated enzyme cascade depresses endogenously expressed canine (Brandsch et al., 1995) and exogenously expressed ovine (Chen et al., 2002) PepTl activity. Whether this regulation occurs from a direct phosphorylation-depen-dent activation of PepTl, or through stimulation of trafficking pathways of cytoplasmic pools of PepTl remains to be determined. Table 3.4. Regulation of peptide transport activity in animal tissues and cell lines. t, I denotes increase or decrease, respectively; x denotes multiples (or limes'); "Differs (P < 0.05) from protein-free treatment. aDS, disease status; HS, hormonal status; NS, nutritional status; ON, ontogenic effect; PM, protein modification; SM, second messenger effect; SR, substrate regulation. bPercentages relative to control value. cMiddle and distal intestine, intestinal mucosa. eBrush border membrane. iethylpyrocarbonate which modifies histidyl residues and blocks function (Brandsch et a/.,1997). ^Anticancer drug that is toxic to cell growth. hA selective cr1 receptor ligand (Fujita etal., 1999). W-7, A/-(6-aminohexyl)-5-chloro-1-naphthalenesulphonamide; a calmodulin inhibitor. ¡CGS-9343B, zaldaride maleate; a calmodulin inhibitor with no effect on protein kinase C. inhibitor of calmodulin-regulated enzymes. '□MEM, Dulbecco's modified Eagle's medium. mLHM, lactalbumin hydrolysate medium. "Casein hydrolysate, consists of 50% free amino acids and 50% peptides. °EGTA-AM, ethylene-glycol-bis-(p-aminoethyl)-W, N, N', /V-tetraacetoxymethyl ester. pdbcamp, dibutyryl cyclic AMP. Overall, despite the above-described understandings, it is still not known whether PepTl expression is regulated by specific nutrient-gene interactions, intracellular signalling in response to cellular metabolic status, mechanical functioning of the transporter, and/or by hormones. What is clear, however, is that the need to maintain PepTl functional capacity must be strong and of especial importance to absorptive epithelial function given that most metabolic challenges result in an increase in PepTl activity. This conclusion is consistent with the understanding that the predominant form of intestinal protein assimilation is that of absorption as small peptides. proteins (4F2hc, rBAT). 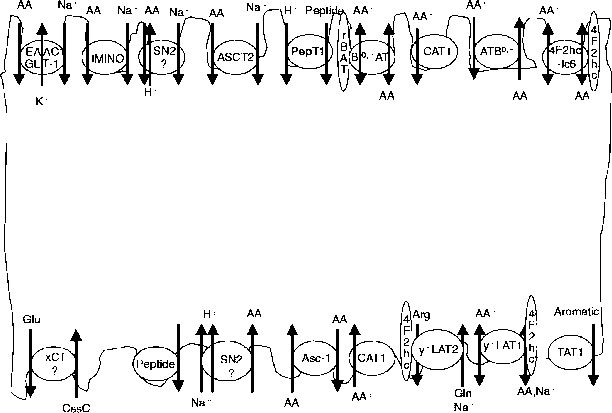 These glycoprotein-associated amino acid transporter family members (Verrey et ai, 2000) account for all known Na+-independent exchange transport activities, and system y+L, which functions dually as a Na+-independent exchanger of cationic amino acids and Na+-dependent exchanger of neutral amino acids. A third concept is that about half of the cloned free amino acid transporters are not capable of net molar flux of amino acids across membranes. Instead, these 'exchangers' selectively import certain amino acids in exchange for export of selected other amino acids.